Release Date:07/06/2018;Notes:Vinyl LP pressing including bonus 7" single. Jilted John is the legendary punk/new wave creation of Graham Fellows (nowadays better known as John Shuttleworth) who's eponymous single was released back in 1978, rising to #4 in the charts and selling nearly half a million copies in the process, and became the most hated song by people called Gordon ever released with it's anthemic "Gordon is a Moron" chant. 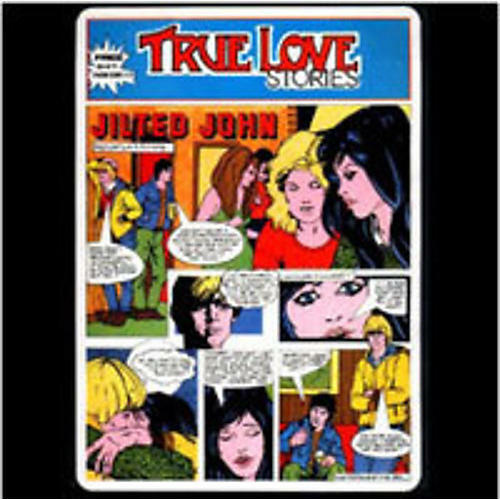 The single was followed by cult classic album True Love Stories, which has been name checked by many as a real inspiration to the likes of Jarvis Cocker and more with it's concept album of the trials and tribulations of Jilted John's teenage angst. Fast forward to 2018, and to coincide with a Jilted John 40th anniversary tour, here is a rather special 40th Anniversary Edition of not only the classic album, which has been out of print on vinyl for over 35 years, but also the legendary 7" single included complete in picture sleeve as per the original Rabid Records release back in 1978. The package also includes new liner notes from Graham Fellows, and a replica of the original "Mice And Ladders" board that featured in the very initial pressing, and collectors have been searching high and low for in copies for the past 40 years! ;Track List:1. Baz's Party;2. I Know I'll Never;3. I Was a Pre Pubescent;4. Fancy Mice;5. Jilted John;6. The Birthday Kiss;7. The Paperboy Song;8. True Love;9. In the Bus Shelter;10. Karen's Letter;11. Shirley;12. Goodbye Karen;13. Bonus 7":;14. Going Steady;15. Jilted John;Special Attributes:WITH BONUS 7"